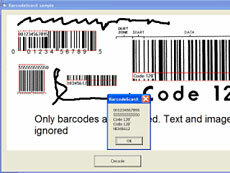 BarcodeScanX is an ActiveX control used to identify and decode barcodes bitmap images.The image can be loaded from image file or passed directly from memory. Image formats: BMP, PNG, TIF, GIF, JPG, J2K, PCX, etc.Just call Scan method and all barcodes in the image are returned as string data.The control has methods to rotate, invert, crop, mirror and filter images before scanning. 32-Bit ActiveX Control (OCX) for Windows95/98/NT/2000/XP. VB6 and VB.Net sample program included! Supports EAN-13, UPC-A, Code39, Code39 Ext., Code 128, EAN-128, ISSN, ISBN, Inteleaved 25, ITF-14, EAN-14 barcodes. BarcodeScanX works with all apps and development tools that support ActiveX: Microsoft Office 97 - 2003, Visual Studio, Visual C++, Visual Basic and Visual Basic for Applications (VBA), J++, Visual FoxPro, Access, Word, Excel, Works 4.5, FrontPage, PowerBuilder, Delphi and many more. You only need the OCX - no other DLLs are required to scan barcodes.